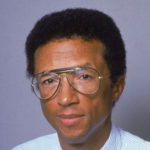 Arthur Ashe was an American professional tennis player who won three Grand Slam titles. Ashe was the first black player selected to the United States Davis Cup team and the only black man ever to win the singles title at Wimbledon, the US Open, and the Australian Open. He retired in 1980. He was ranked World No. 1 by Harry Hopman in 1968 and by Lance Tingay of The Daily Telegraph and World Tennis Magazine in 1975. In the ATP computer rankings, he peaked at No. 2 in May 1976. "I have tried to keep on with my striving because this is the only hope I have of ever achieving anything worthwhile and lasting." "We must reach out our hand in friendship and dignity both to those who would befriend us and those who would be our enemy." "If I were to say, ‘God, why me?’ about the bad things, then I should have said, ‘God, why me?’ about the good things that happened in my life." "The ideal attitude is to be physically loose and mentally tight." "I have always drawn strength from being close to home." "There is a syndrome in sports called “paralysis by analysis.”"
"We must believe in the power of education. We must respect just laws. We must love ourselves, our old and or young, our women as well as our men." "Trust has to be earned, and should come only after the passage of time." "When we were together, I loved you deeply and you gave me so much happiness I can never repay you." "You learn about equality in history and civics, but you find out life is not really like that."